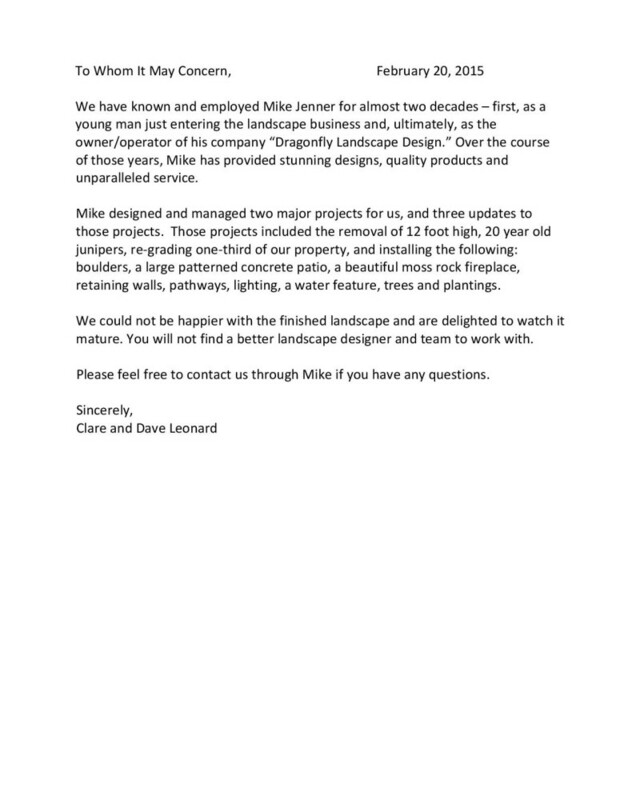 “Mike, Thanks for a fabulous job on our landscaping. Your design and grouping of colors really make our rock garden stand out. 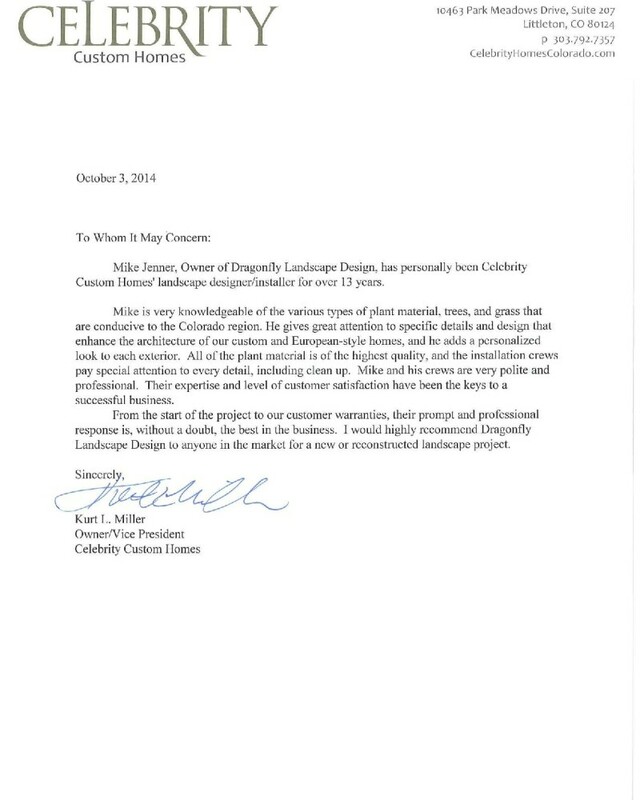 “Mike, no one compares to the quality of work and customer service Dragonfly Landscape Design provides. They provide excellent quality work at a reasonable price. It was nice having you listen to our ideas for our yard and conveying that to the presentation of the amazing plans. By doing this, we knew we had chosen wisely. Throughout the construction of the yard, Adam was “hands on” during all of building phases and exhibited talent and care to detail that transformed the plans perfectly. All products used and construction elements were of the highest order, and the project was completed in record time. I really should be sending you pictures of Treasureland Preschool children playing in the new sandbox. They are ecstatic to have so much space in which to play and the water and sand play has brought investigation, discovery and a ton of fun! We are grateful for your work and appreciate all that you did to finish it in a timely and safe manner. Your employees were a delight to watch as they laughed and worked tirelessly to complete the job. Using wheelbarrows to transport the sand from the street to the playground was not an easy task; there were a couple of times one of the wheel barrows fell over before it was unloaded in the right area of the sandbox and the guys were bent over double with laughter – it reminded me of our children only they were just a bit bigger! Thank you again for your efforts to complete this job and leave us with such an amazing space to play and learn. The children don’t leave the area and are delighted to have this new space. Best wishes to you and your company. If you need anything else from me, please let me know. 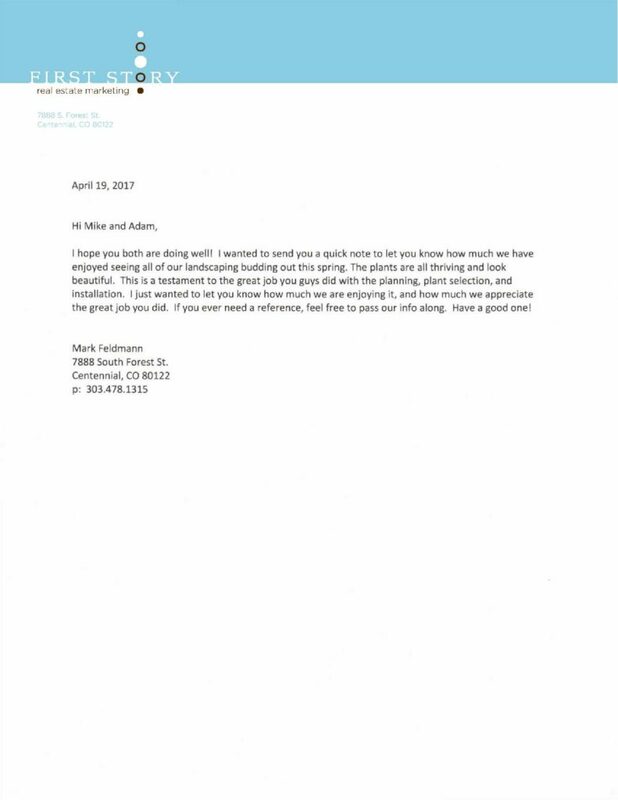 We only had dirt and deer in the backyard when we moved into our newly constructed home in the Inspiration neighborhood of Aurora. 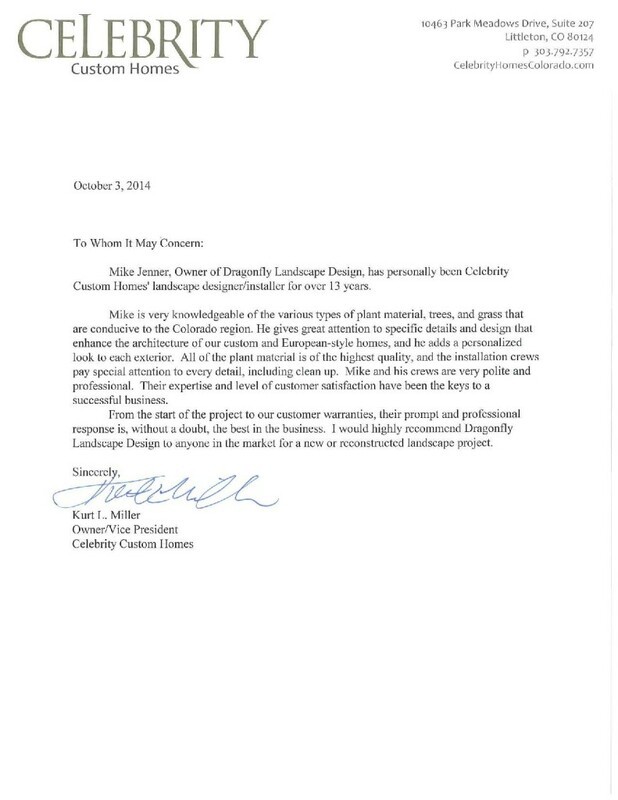 We met with a few landscaping companies and we were the most impressed with Patrick Bolton of Dragonfly Landscape. He met with us right away and submitted an artistically beautiful design within a few days of our first meeting. 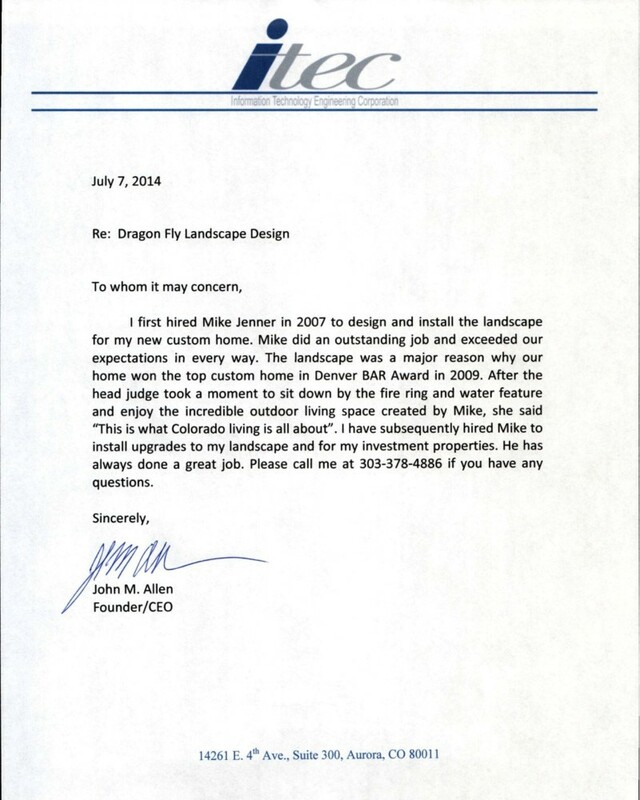 He worked with us through some revisions in a friendly and professional way. You can tell that he loves his work and cares about people. We like the variety of plants and trees and the multi-dimensional flagstone patio is absolutely stunning! 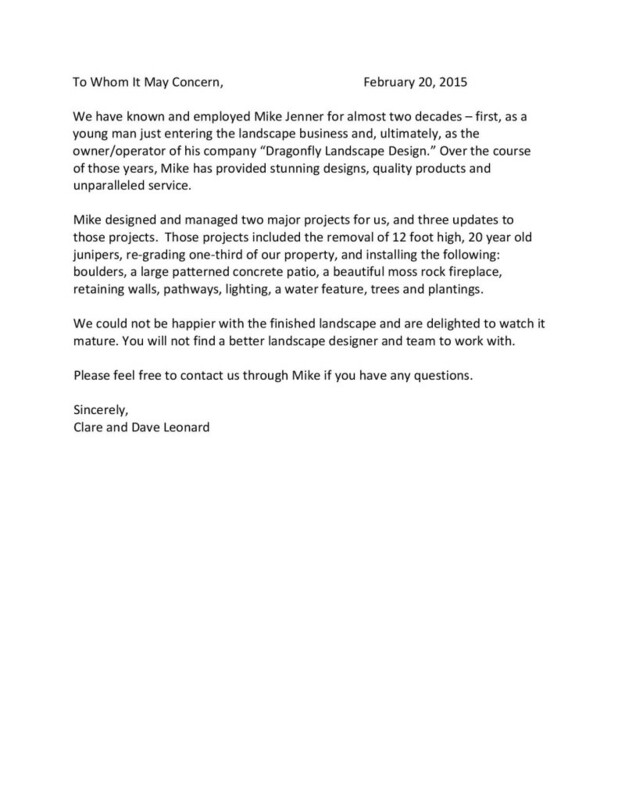 It is always good to get a few estimates, but do yourself a favor and get one from Patrick of Dragonfly Landscape. He is a standout in customer service. 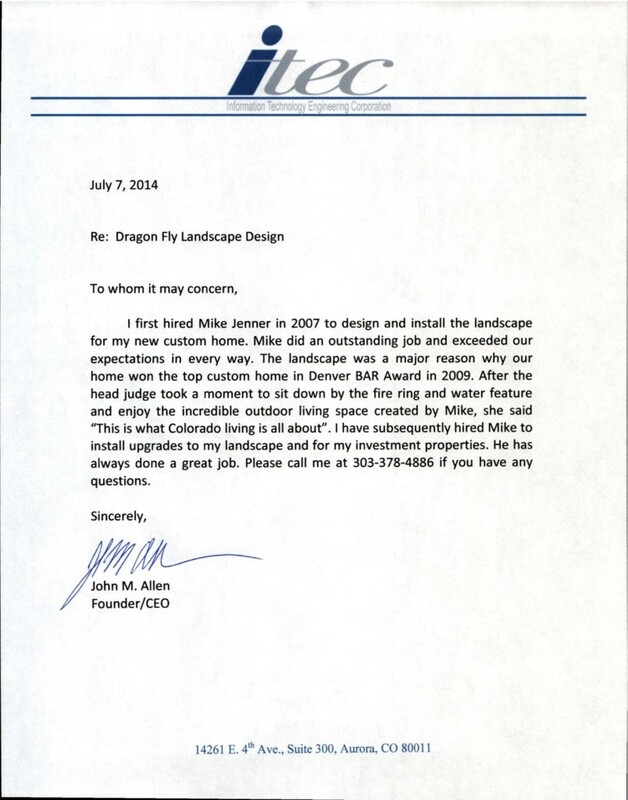 “We are extremely happy we chose Dragonfly Landscaping to design and install our landscaping. We are thrilled with the new look of our yard; Patrick Bolton and his team were great to work with! 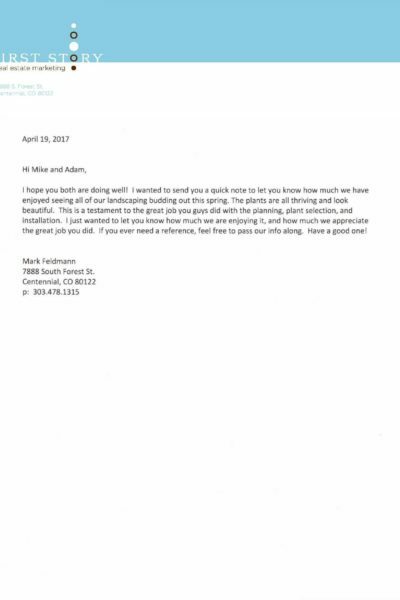 From our initial meeting with Patrick we found him to be very professional and easy to work with, he didn’t try to oversell anything at any time. Our calls were always answered at the office and if Patrick wasn’t available, he returned our phone calls promptly. It’s obvious Patrick cares about quality work. Patrick came by many times to check that the yard was being done correctly and did some things himself when needed. We have seen Patrick or his team checking on the yard several times.